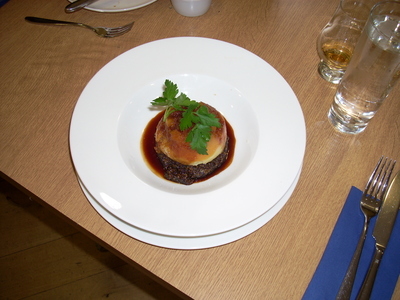 Here is a picture of Neeps and Tatties on top of Haggis. Neeps = bashed turnups, Tatties = mashed potatoes, and Haggis is haggis. I think haggis is essentially lamb meatloaf. It’s made of ground lamb, oats and spices. In old times they made it in sheep guts, but just think of sausage and you get past that little bit of unpleasantness. At home I make my meatloaf with ground elk burger, some sort of grain (cornflakes, oats, bread crumbs) and egg and spices. The truth is that we really like haggis. If we were here longer and if we had more money we would have it again. And again. It was that tasty. Who knew? Come to Scotland and discover a new side of you. Hmm, my feeling about meatloaf in general remains unchanged. And YOU know what that is!!! Toss in some liver and you essentially have it, reminded me of pate. Not bad but not something I’d like to eat daily!